New video! We’ve been out and about, exploring a bit of wild Florida (some wilder than others!) during this nice summer weather we’ve been having. OK, sweltering heat broken by intermittent mini-hurricane like afternoon storms. As per usual. There are many Shell Islands around the country, the state even. One I wrote about a while ago on our Gulf Coast Panhandle adventures in Panama City. 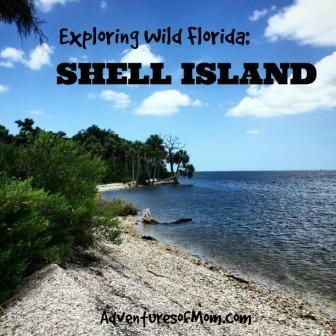 You can reach that Shell Island by ferry from the state park. Read about that here (and go very early to avoid the summer crowds!). This one in Crystal River you can only reach by boat. Rent one at King’s Bay, use your own, or get a lift with a friend (just make sure you get a lift back too! ), and watch the weather! There are no amenities on the island, and being in the Gulf of Mexico, the water is salty, even in the lagoon- bring your own drinking water and food and carry out your trash! The beaches are completely made up of shells- sharp oyster shells, so keep those shoes on or you’ll cut up your feet. This Gulf island at the mouth of Crystal River is made up of oyster shells, thus the name: Shell Island.